Discussion in 'SiriusXM Sports' started by semipenguin, Jan 15, 2009. Post a picture of a stadium. Whoever gets the name of the stadium gets to post a picture of the next stadium. It can be a picture of any stadium. One that is around today or doesn't exist anymore. It must be a stadium used by a professional or college team. It can be an indoor or outdoor stadium. It can be a picture from the inside or the outside. DoublEE and AJ_II like this. Should we have hints if people are stumped after a day or so? great thread! Polo Grounds? Can we guess more than once? The park was built in South Los Angeles in 1925 and was named after William Wrigley Jr., the chewing gum magnate who owned the first tenants, the original Los Angeles Angels minor-league team. 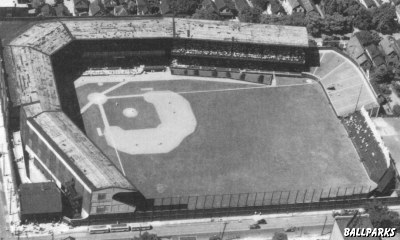 In 1925, the Angels moved from their former home at Washington Park (Los Angeles), which was also known as Chutes Park. Wrigley also owned the Chicago Cubs, whose home is a more famous park also named after him. Here's the next stadium...not the best picture I could find, but it was the only one without the name of the park in the URL address (to avoid all you cheaters! )...and I don't know how to do Imageshack or Photobucket or whatever. Cool...this looks like it'll be a popular thread, so I'll have to look into that for future use. Hints: Only parts of this structure still exists. The extremely short right field should give you some clue to what park it is. Judging by your hints and the fact that you're an Indian fan, I'm guessing League Park...even though I can't even see the image! Correct. Sorry about the tripod image.